Debacle: Following Senate GOP's Healthcare Collapse, What Comes Next? Late Monday night, Mike Lee and Jerry Moran blindsided the White House and leadership by announcing that they would refuse to vote in favor of a motion to proceed to the Senate's Obamacare replacement bill, effectively killing it. With Rand Paul and Susan Collins pledging to do the same, the GOP lacked the tallies even to move forward on the legislation, foreclosing the possibility of debate, amendments and a final vote. As I argued yesterday morning, this is unacceptable; Republican voters shouldn't forget what happened here, especially if and when things get worse -- which I suspect they will. Rather than entering a formal debate on the bill, these Senators joined forces with Chuck Schumer's obstruction. Rather than proposing changes to the bill in a limitless "vote-a-rama," they torpedoed any chance of improvement or passage. Rather than working to at least theoretically enhance the legislative language before determining whether to cast an aye or nay on an imperfect non-repeal package (that at least arguably makes important progress), they ensured that the GOP would not even hold a final vote on a replacement plan they've been promising voters for seven years. This is a debacle and a betrayal. What was never clear to me was what might come next, in the event that the Senate's bill crashed and burned. 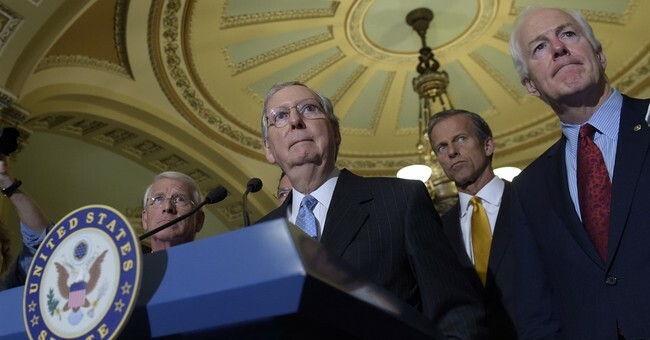 Now we know: Mitch McConnell (who's angered some members by allegedly speaking out of both sides of his mouth) issued a press release stating that the Senate would instead take up the House-passed bill, which would serve as a vehicle under reconciliation rules to enact an immediate overhaul amendment to effectively replace the whole thing with a 2015 repeal bill that passed both chambers. And yes, that bill was much closer to a full repeal than this year's House or Senate bills ever were. If it were to pass, most of Obamacare's guts would be ripped out, although many of its regulations would remain intact (which would plunge the individual market into even deeper instability, absent additional measures). The implementation of these changes would be delayed by two years, creating a countdown clock for Congress to pass something else to head off a looming policy disaster. Before we go even one step further in this analysis, does anyone have confidence that the current merry group of lawmakers on Capitol Hill would fashion and pass a responsible, consensus, conservative reform by 2019, having failed to figure out how to do for seven years? Under the gun, would Republicans suddenly discover a fabulous policy breakthrough that would be better than the bill they just killed? Portman says he's "concerned about something that will just repeal"
Capitol and Portman both voted 'yes' on this exact bill two years ago. The only thing that's meaningfully changed in the interim is the likelihood that their vote would mean something. McConnell might gain Paul and Lee with this gambit, but the entire centrist flank is running for the hills. This was totally and entirely predictable, including by the conservatives who've demanded this very scenario. I therefore don't think it's premature to declare the new plan dead on arrival. Okay, so then what? McConnell isn't stupid, so he surely anticipated his latest suggestion would slam into a brick wall. What he seems to be doing here, therefore, is checking all the failure boxes ("we tried X and Y!") before moving to Plan C: A "bipartisan fix" to Obamacare that several moderates have been advocating. What would that look like? For starters, we can all but guarantee that even under a best case scenario, the resulting patchwork will be decidedly less conservative than the just-killed Senate bill. Many of the Democrats' ideas to "improve" Obamacare are diametrically opposed to anything Republicans can support -- from larger insurer bailouts, to a more coercive individual mandate tax, to a "public option," which would hasten the collapse of the private individual market by undercutting insurers with a artificially-"affordable," taxpayer-subsidized plan. Serious and needed Medicaid reforms would be off the table, as would be virtually anything even resembling repeal. Democrats might toss Republicans a few bones on Health Savings Accounts, or some minor regulatory or mandate flexibility, but all of the leverage will have shifted leftward. After all, Republicans would have just illuminated a giant neon sign over their conference reading, "we can't govern on our own." Let's say that enough votes are cobbled together to advance a bipartisan push to officially enshrine and bail out Obamacare. Would Senate conservatives mount a filibuster? Would House Republican leadership be forced to ask Nancy Pelosi for the votes to pass it? Or would the Frankenstein Obamacare legislation also die somewhere along the line, leaving failing, sputtering Obamacare fully intact? Let's face it: The Democrats' law is collapsing and deteriorating further, harming millions. Having vowed to get rid of the law for four consecutive national elections, winning three of them, Republicans would enter the next cycle with one of two outcomes to show for it: Either a big government fix, or...nothing at all. The former would be a shocking affront to the party's base, which worked so hard for so many years to reverse a terrible policy. The latter would hang Obamacare's victims out to dry. And in either case, Republicans would be full co-owners of the new status quo. Oh, and when Democrats finally win some elections -- which will happen eventually, perhaps sooner, perhaps later -- they'll be waiting to pursue for their long-awaited final step: Single payer. Republicans may marshal great arguments against a terrible, unaffordable government-run healthcare regime, but Democrats have shown a willingness to take really hard votes to advance the ideological ball. Despite their many Obamacare lies and fairy tales, they'll relentlessly pummel Republicans as unserious about healthcare policy. And they'll have plenty of Republican-furnished evidence to prove their point. Good work, everyone. Vote Republican: "We'll figure it out later!"